Valve’s Gabe Newell always seems to find time to fire off an email here and there to eager players wanting to know more (or, well, anything) about Half-Life 3. He’s been at it again recently, although the information contained within will not be great news for people hoping for some kind of Valve surprise at E3. That ‘stuff’ includes Dota 2 and Counter-Strike: Global Offensive. Nothing else is on the E3 agenda. 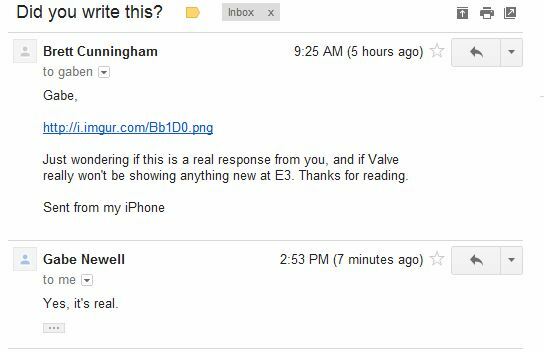 Just to be sure, someone else from Valvetime sent Gabe a follow-up email, asking if the first one was real. The reply suggests that it is.